Basal Cell Carcinoma Nevus Syndrome :: Adgero Biopharmaceuticals Holdings, Inc.
REM-001 Therapy has also been studied in patients with basal cell nevus syndrome ("BCCNS") who developed extensive basal cell carcinoma. BCCNS is a rare but serious condition that is often characterized by the formation of multiple and recurring cutaneous basal cell carcinoma lesions. The FDA granted orphan-drug designation to REM-001 in the rare disease indication of BCCNS in January 2018. 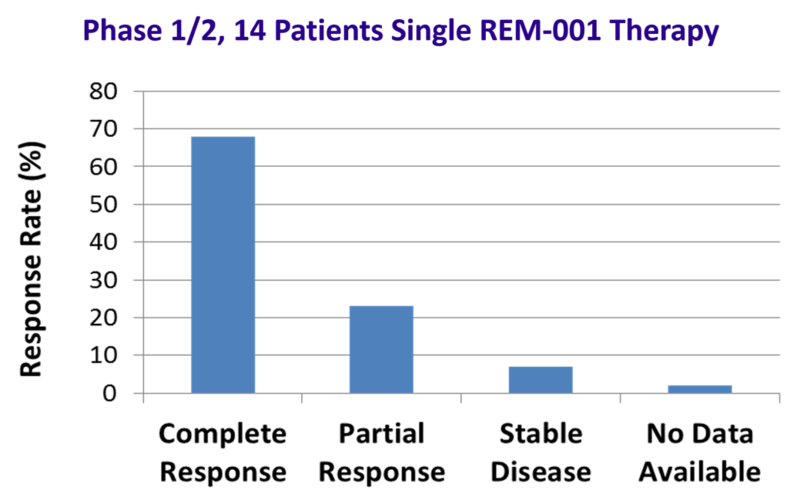 In a Phase 1/2 clinical trial (CA001B), 14 patients with BCCNS were enrolled and treated with REM-001 Therapy. A total of 157 lesions were treated in these patients and showed a 91% overall response rate. This was composed of a 68% complete lesion response rate (no remaining visible evidence of a lesion) and a 23% partial lesion response rate (lesion was reduced in size by more than 50%). In addition, 7% of lesions had stable disease (any increase in lesion size was less than 25%). The various response rates are shown in the graph below and are similar to the results seen in CMBC patients as we would expect. Until the recent FDA approval of the drugs Odomzo and Erivedge, treatment options for these BCCNS patients were very limited. However, we believe that, based on their package inserts, Odomzo and Erivedge have dose limiting toxicity profiles that are broader in scope than the primarily transient adverse effects observed with REM-001 Therapy. We also believe that the potential toxicity limitations related to the existing therapies for BCCNS, plus the positive initial Phase 1/2 data generated in clinical trials with REM-001 Therapy, suggest that REM-001 Therapy could be a viable alternative in treating recurrent basal cell carcinoma in BCCNS patients. For more information about BCCNS, please visit www.bccns.org.